Be mindful of your thoughts as they are shaping your reality. Our minds are extremely powerful tools in creating our lives. If we continue to think we are not enough, we won’t be. If we obsess about not being beautiful, we won’t appear that way to others. If we don’t think we have enough money, we won’t. If we worry about getting sick, we can become sick. Thoughts are energy and they are sending the energy into the universe, and the Universe is sending it back to you without judgement or labeling the thoughts as good or bad. Only humans attach labels to people, things, situations and experiences. Like attracts like, and it is the same with energy, and since your thoughts are energy, you are attracting that same energy back to you, creating and shaping your reality. This is the Law of Attraction at work. Change your thoughts, change your reality. It’s important to create our reality the way we wish to see it. If we wish to see more peace, think about more peaceful situations, things, people and experiences. If we wish to see more love, think about more loving people and ways to be more loving. Shaping our reality by thought energy is simply changing the way we look at things. In this image, some may see an old bent tree. Some will see the beauty in the bark, the way the roots are holding strong or the way the tree is making the best of it’s living space. All realities exist, but it comes down to the one you wish to see, what perspective you wish to take and how you want your reality to be created. What we send out, comes back to us. Be mindful of what you are sending out to the universe in thought form, and only send out what it is you wish to be returned to you. If there is a difficult person in your life, and all you can think about is how angry this person is, or perhaps how mean they are being, or wrong or whatever the case may be, this is the type of energy you are feeling and creating in your life. You are creating more scenarios in which other people with these types of feelings or traits appear in your life. Instead, consider the possibilities they are not who you think they are to be. Consider they have had a traumatic life and do not know how to heal or change themselves. Many scenarios exist in all our lives, and with many people, we do not know what type of life they have lived to bring them to where they are today and how they are coming across. Compassion and understanding is needed. You may not be able to help them physically, but you can send them thoughts of love and light, helping their soul. And, in return, the universe sends you compassion, understanding, loving people to help you in some fashion. Realize what you think is the world you live in. Recognize that we can either think in loving peaceful terms, or compassionate kind terms. We can think something completely opposite. Whatever we think of the world is the way the world appears to us. We can think the world is a wonderful place to be, full of wonder & magic. Or something else. We can think there is more loving people in the world or not. It’s all up to you to create your reality. This is what it means to create your life with your thoughts. We all live in the same world, but it’s our thoughts which create our view of the world, thus creating our reality. The more we send out positive thoughts, the more the Universe ,through the Law of Attraction, will send us positive people, situations, resources and experiences. Manifesting with your thoughts is another step towards creating your dream life and living your passion, purpose & soul mission. It takes practice to keep our thoughts positive. Therefore, if you find yourself having a thought about someone which you would not want returned to you in any way, state “Cancel” either in your mind or aloud. Then replace that thought with another positive one including and exuding warmth, love & compassion. Use positive power statements such as “I AM loving.”, “I AM compassionate.” , “I AM understanding.” to replace the thought and cultivate more of that energy in your life, thus changing your reality. This helps to strengthen the positive qualities and traits, scenarios and experiences, and opportunities you wish to manifest in your life. As you work on changing your thoughts, your words will also begin to change. Words are spoken thoughts and more powerful energy. As you change both thoughts and words, your actions will change. Your actions are also energy which needs to be used to help you in the best way possible. All of your thoughts, words and actions are working together, creating the type of energies manifesting in your life. Begin working with the energies of thoughts to create your reality now. Your soul, and the universe, will thank you for it! Send out into the world only those thoughts and energies you wish be returned to you. 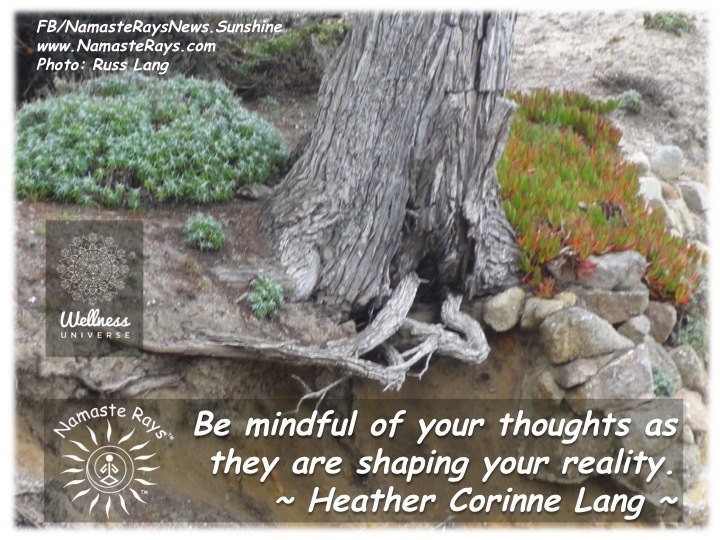 I keep reminding myself that Heather “Be Mindful”. Keep up the good work! We eventually listen to ourselves… Namaste!